Now, I like a good urban myth as much as the next person and this one has had so many incarnations as to be part of our national folklore. It goes like this: A midwesterner enjoys a meal at a fancy restaurant in a big city* and, after tasting a fabulous dessert, asks the waiter for the recipe. The waiter complies, and then the unsuspecting diner receives an exorbitant bill for the recipe. Determined to exact revenge, she (for it's always a woman) vows to share the recipe with everyone she knows. The myth -- or some version of it -- has been traced back to 1948 when the Waldorf Astoria Hotel "charged" a patron $25 for a red velvet fudge cake recipe. (A modern day incarnation is the $250 supposedly charged by Neiman Marcus for a cookie recipe.) It's easy today to distribute these recipes via the internet. 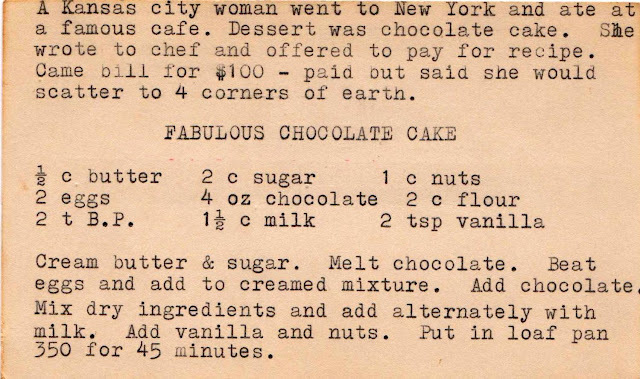 Before that, women relied on the recipe card. I found the card pictured above -- a c. 1960s variant on the urban myth -- in a recipe box in my collection and just had to see if it lived up to the $100 supposedly charged for it. Executive summary: It's pretty good, but not the chocolate cake of my dreams, as it has nuts in the batter, an ingredient I think best in brownies, not cake. Still, it went over quite well with all of my tasters. Of course, they got it for free. This is a very simple cake to put together. 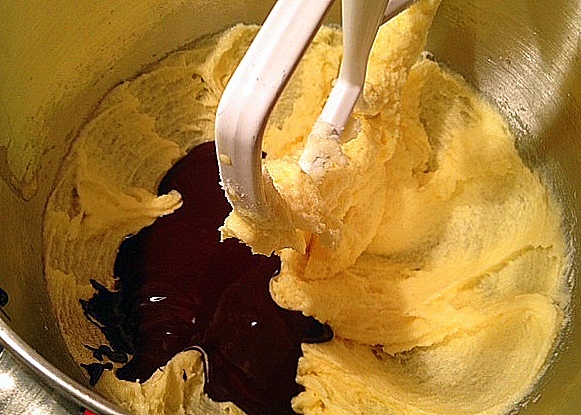 Melt the chocolate in a double boiler (or a bowl placed atop a pan of water) before adding it to the butter mixture. 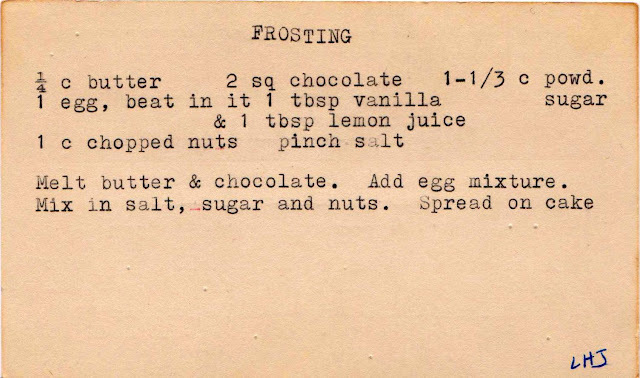 There is a lot of sugar in this recipe, but it is not too sweet. You'd think that for $100, they'd tell you what size pan to use, instead of the cryptic "Put in loaf pan" in this recipe. I wasn't sure what to do, as in the old days, loaf pans did not necessarily mean loaf pans for bread. So I compromised and put most of the batter in an 8 x 8 pan (lined with parchment, otherwise grease and flour the pan, another glaring omission from the recipe). The rest I put in a glass loaf (as in bread loaf) pan. Next time, I would use a 9 x 12 pan. The cake and frosting recipe below. I realized too late that I used just one square (one ounce) of chocolate for the frosting, but it was perfectly fine. *The big city is usually Chicago or New York, reinforcing yet another historical American belief that large cities, unlike their rural counterparts, are filled with sin and corruption. I agree that there´s nothing particularly interesting about this cake, but the story will never end. I´ve had the neiman marcus recipe for 15 years, but never tried it!